EditPad Pro is a powerful and versatile text editor or word processor, designed to make text editing as convenient as possible. Write and edit all your plain text files such as source code, scripts, web sites, logs, letters, memos, reports, articles, etc.Edit text documents more comfortably with EditPad Pro's tabbed layout, live spell checking, column editing, extensive clipboard and block editing abilities, project and file management, keystroke macros, word count and other statistics, text wrapping and unwrapping, opening all files from certain folders, alphabetic sort, bookmarks, character map, etc. Supports all languages, including Far East languages.Write source code more easily with EditPad Pro's syntax coloring, file navigation, code folding, search and replace with regular expressions, running external applications or scripts, persistent and rectangular selections, hexadecimal mode, integrated diff to clearly compare files, built-in FTP, auto and block indent, line numbers etc.Save time typing and edit complex documents faster with the Clip Collection. Store and instantly reuse standard phrases, formatting tags and source code snippets. Temporarily store and easily move and duplicate blocks of text. Adjust your text editors to your tastes and habits. 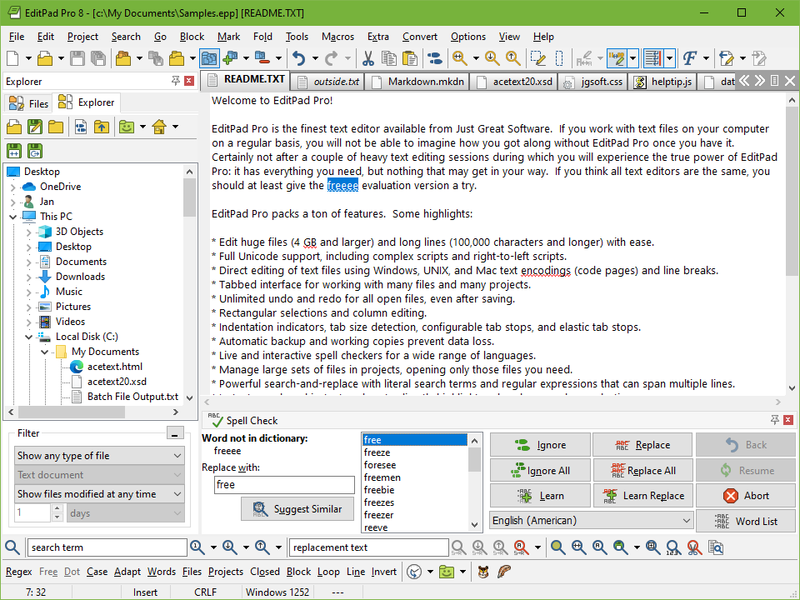 EditPad Pro is extremely configurable, with many options specific per file type. Download or create syntax coloring and file navigation schemes for any programming language or file format.Open, edit and save text files compatible with Windows, Linux, UNIX, OS X, Classic Mac, DOS and even IBM mainframes. EditPad Pro supports CRLF, LF and CR line break styles, all Unicode formats, all Windows and ISO-8859 code pages, as well as many legacy DOS, KOI8 and EBCDIC code pages.Unlimited file size and line length. Unlimited undo and redo, even after saving.